What a super Sunday it was in the FIFA World Cup 2018. Three matches and three end to end matches saw Sunday turn out to be the most exciting day in the 2018 edition of football’s biggest tournament. It was a day of upsets with the underdogs finally stepping upto the party. 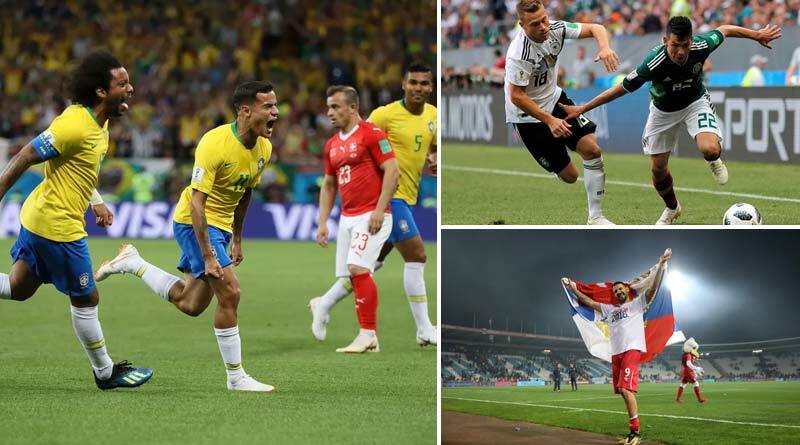 Unexpected results and gritty performances from the lower ranked nations saw defending champions Germany slip to a 1-0 loss against Mexico while one of the favourites this year Brazil were held to a 1-1 draw by Switzerland. The opening match of the day was the only one that panned out according to everyone’s prediction. Serbia came out on top against Costa Rica after defeating the Costa Ricans by a goal to nil. A stunning goal by Aleksandar Kolarov was enough to see the Europeans through on the day, making it four wins out of four for Serbia against CONCACAF nations. We now turn our attention to the evening kick-off which threw up the biggest upset of the world cup till now. One of the most entertaining game this year saw a completely attack minded game being played out between Mexico and Germany with both teams attacking right from the first minute. While Germany created some good chances in the initial moments of the match, Mexico defended resolutely as they sat back waiting for the right chance to counter. And counter did they. Their lighting fast attack troubled Germany throughout as their defence was unusually shaky with Boateng and Khadira committing mistake after mistake, letting the Mexicans past them too easily. And it finally cost the reigning champions who conceded to Irving Lozano in the 36th minute as El Tri raced into a 1-0 lead. Despite continuously knocking on the Mexican door in the second half, Germany failed to break through their organised defence with goal-keeper Ochoa producing a massive performance. He kept out all of Germany’s nine shots on target to ensure Mexico’s biggest footballing win in their history. And the 11:30pm IST kick off did full justice to the 17 crore Indians who had stayed up to watch Brazil take on Switzerland FIFA World Cup 2018. Starting strongly Brazil were on the top of their game and fully lived upto everyone’s expectations of tournament favourites. Their heavy pressure finally paid off as Coutinho scored a stunned to put Brazil into an early lead. It was all down-hill for the South Americans thereafter though as they for no apparent reason lost their way after the interval. The second half was a pale performance by Brazil in comparison to their first half which the Swiss made the most of. The equalised via a corner with Zuber getting on the end of it in the 50th minute to level the score. Neymar, Willian, Jesus all struggled with coach Tite making unfathomable substitutions which failed to spark Brazil’s game, meaning they had to end the match with a shock draw.